Recommended for clubs, companies, corporate team building, schools, colleges, oshc, kindergartens, holiday programs, festivals, fairs, fetes, markets, birthday parties, weddings, community centres, libraries, country events, youth groups, conventions, product launches, special needs groups, disability groups, camps and sport centres. For our clients, we have a range of experienced tutors who are specially trained to teach and perform circus skills to children, young people and adults. Workshops are learner-centred and we adapt activities to meet the needs of all people within a group. We know that everybody has the ability to learn circus skills and everyone can succeed within a short space of time. Our philosophy is to ensure that all circus activities are challenging but achievable and that most importantly learners will benefit from what they learn. Kindergarten children gain an early insight into their motor skills, coordination, building human relationships and life skills. Workshops designed for 5 to12 year olds aim to provide children with opportunities to develop their hand eye co ordination, team building, individual work, personal confidence, motor skills, strength, and power, whilst enhancing their imagination and having fun. Workshops for teenagers develop confidence, team work and individual skills required for life learning. 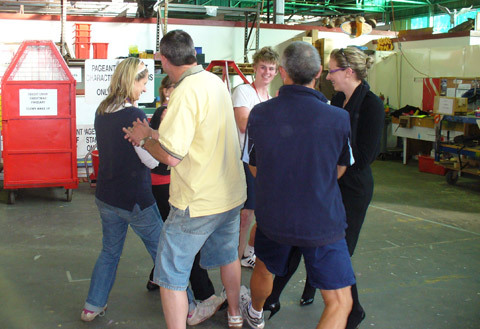 Adult workshops are designed to balance left & right brain mechanics and improve team building skills. Circus skills workshops encourage you to come and try new things and have fun clowning, juggling, balancing, rolling, acrobalancing and playing in the art of circus. Design your own show from your own imagination whilst learning new skills to perform. You are the creator of your own dreams and reality. Participants will work in groups and individually. No experience is required. The workshops aim to develop participant’s confidence and performing skills. Participants are encourage to bring body and heart to laugh with new friends and experience amazing things. Jessica is an encouraging teacher and believes we all have our own innate wisdom waiting to tapped into with positive encouragement in a safe environment, allowing creativity to be freely expressed. Students develop at their on individual pace by learning new skills so that they can perform or just enjoy the learning process. Students gain inner confidence within themselves and as a group.For a first hand account of a typical circus skill workshop, see the television feature about circus skills produced by Channel 7. Duration: 1 hour. More intense classes for teenagers and adults last for up to 2 hrs. Drop in workshops are 3 hours. 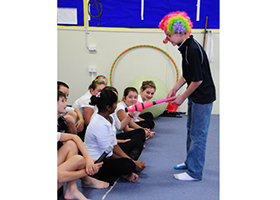 Regular workshops: Up to 10 circus skills classes are held over 7 to 10 week blocks, for 1 hr per session. Workshop size: a maximum of 30 participants per workshop. Over 30 participants are required to hire 2 trainers. 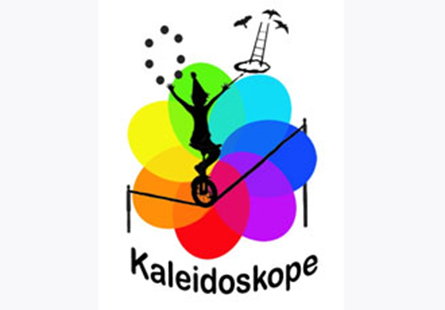 Equipment: all equipment and materials are provided by Kaleidoskope. When booked by schools, access to gym mats will be required. Space requirements: a hall, gym, activities room, or out door area with cover or out of direct sun. Clothing: students are required to wear comfortably fitted clothing – preferably not skirts or dresses. Hair should be tied back. Lesson plans: teachers may ask for lesson plans on request. Follow up exercise sheets are also available by request. Special requirements: workshops can also be designed to the needs and requirements to suit the club, school or company’s existing programs and structures. 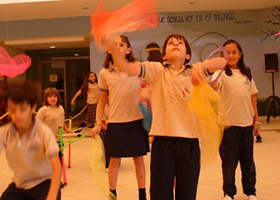 Circus skills have many benefits to offer teachers and pupils alike. As part of the curriculum, circus can be introduced into Science, Maths, English, Art, Drama, Physical Education, History, Geography and more; at all key stages. With a fun day or a ‘themed week’ we can broaden the horizons of your pupils. 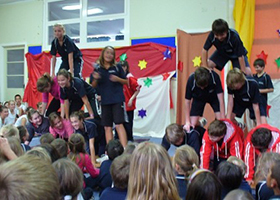 A weekly booking includes a performance by participants, which enables them to demonstrate their newly acquired skills to parents or guardians. Project sheets are also available on request. The wonderful thing about circus workshops is that what has always seemed impossible when watching a performance becomes a reality for many people. Non-competitive games allow participants to develop in a group and allow people to form respect for others within that group, as all people are treated as equals. It has become evident, through experience, that group work and respect give many people a wonderful boost to their self esteem. In addition to the above, circus skills offers physiological benefits in that it can improve fitness, while being fun and also can help people with poor attention. Juggling requires the participant to activate both the right and left sides of their brain, resulting in improved co-ordination. Brain mechanics are a vital part in how we learn. When juggling, the juggler balances up the left and right brain. By facing challenges and risks, the brain builds new neuron pathways, and develops new learning abilities that apply to other areas of people’s lives. Motor skills are developed by using hand-eye coordination and spatial awareness. 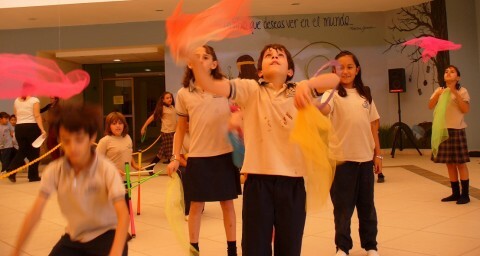 Fitness is an important part of circus skills for every student. 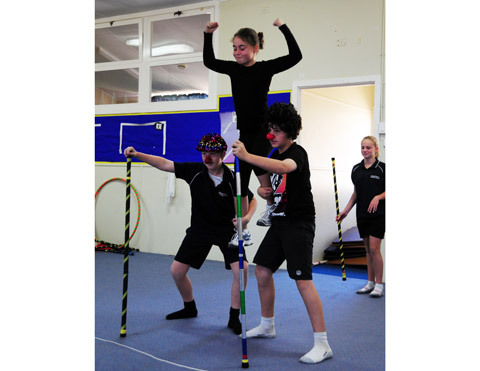 Learning circus skills means a regular exercise routine, which is part of life skills and creates a healthy lifestyle. Students learn about their body and how to live well. Team building skills are required throughout every person’s life, whether team building leads to leadership roles or just being part of the team. Team building helps student’s work through problems and produce positive solutions. 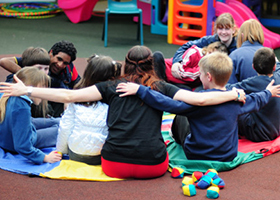 This develops healthy group relationship skills for individuals and promotes life skills. Goal setting is required to divide skills into small steps; a process which requires commitment, practice and persistence. Challenges can be set to range from easy to hard. Appropriate goal setting allows for personal achievements to be recognised. Creativity is an important aspect through play and imagination. Creativity is enhanced by using interesting equipment and props for many different uses. Seeing, creating and learning new skills and tricks is emotionally and mentally stimulating and teaches people that anything can be achieved, just by “having a go”. Confidence is improved through achievements and peer relationships. Circus skills is non-competitive which means everyone can be good at them. Students are required to work together to help others. Jessica Pierce will conduct a serries of circus skills and drama workshops for a wide range of students and their required age groups. Performance students will learn skills and activities as individuals in partners or in groups to make performing an easy and fun process. Workshops promote confidence, strength, virtues and encouragement for all students no matter what experience they have. Workshops are designed to provide students with new skills, hand-eye coordination, teamwork, balance, understanding of their body, enhanced imagination and creativity, whilst having fun.Workshops provide an opportunity for students to perform and gain inner confidence within themselves and as a group. Duration: 1 hr to 2 hrs. 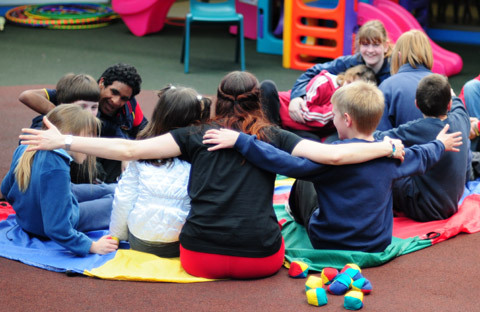 The workshop will provide a variety of activities in games, team building, play roles, drama, performance, problem solving, analysing other people and their behaviour, role models characters, juggling, circus skills, oppressed theatre and principles around respect. Students will have the opportunity in groups to discuss some incidents where they have been previously bullied and perform the incident, how it happened in real live. Or, they may choose to make up their own story. Students will think of new options of how the problem could be solved. 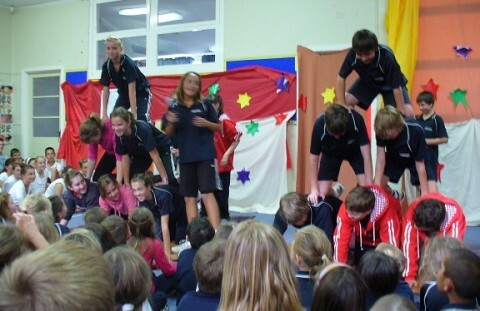 Other class members will re-enact the performance with new positive outcomes. This allows a healing process to be created and gives students confidence, strength, personal power and a new faith for life. Students learn to understand by recognising what bulling is and how it affects others, often for a life time or on a much deeper subconscious level than they realise. They then have the opportunity to change their future for themselves and others. Experience the history and art of clowning from the ancient masters who began clowning in the 14th to 16th Century. Learn from White Face, Arlecchino, Tramp, Jester, Charlie Chaplin and many more. Students will learn skills and tricks of the trade to develop simple, professional clown characters that are original, versatile and extremely fun to explore. Students will experience character development, using props in different ways, and creative exercises to lead up to performing. Students will experience taking on leadership roles and just being a good clown group member. Students learn about gaining confidence in improvisation and going with the flow. Students learn about designing and creating clown sketches to perform. There is no right or wrong in clowning, so everyone has the capacity to be a success. 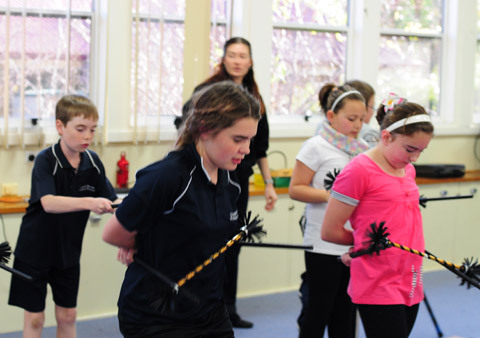 This workshop can be added into a drama, history or physical education program. Hand out follow up sheets are available if requested by teachers. Recommended for: 7 workshops are recommended for building performances. Every day we see and experience different characters from our environments, the world around us and as a part of history. This workshop provides students with an understanding of characters. It teachers students tools and techniques of how to become and create any character of choosing. The understanding is created through deportment, body structures, communication, dress and costume, emotion, personality, attitude and presence. The workshop includes easy exercises to lead participants, to work in partners or in groups, and to become high status characters or low status characters. This is a fun and rewarding workshop that can also be designed for performance requirements. Many people who have seen a circus show have often wished that they could also achieve those skills. Now you can by making your very own circus material to have, own and use. It is great to make something that you can show off with tricks and then to say, “I made it myself.” Every one will be very impressed. Students will make one of the following circus items bellow to take home. All materials are included. A performance workshop is also recommended so students can learn to use their equipment with confidence and gain an understanding for learning new skills and tricks to perform.